Data from a major US atom smasher lab may have revealed a new elementary particle, or potentially a new force of nature, one of the physicists involved in the discovery told AFP on Wednesday. This image obtained in 2010 from NASA\'s Hubble Space Telescope shows an immense cluster of galaxies located 2.2 billion light-years away. The physics world was abuzz with excitement over the findings, which could offer clues to the persistent riddle of mass and how objects obtain it -- one of the most sought-after answers in all of physics. 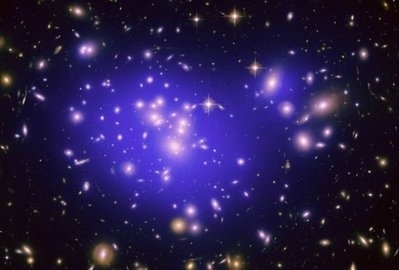 But experts cautioned that more analysis was needed over the next several months to uncover the true nature of the discovery, which comes as part of an ongoing experiment with proton and antiproton collisions to understand the workings of the universe. "There could be some new force beyond the force that we know," said Giovanni Punzi, a physicist with the international research team that is analyzing the data from the US Department of Energy\'s Fermi National Accelerator Laboratory. "If it is confirmed, it could point to a whole new world of interactions," he told AFP. While much remains a mystery, researchers agree that this is not the "God Particle," or the Higgs-boson, a hypothetical elementary particle which has long eluded physicists who believe it could explain why objects have mass. "The Higgs-boson is a piece that goes into the puzzle that we already have," said Punzi. "Whereas this is something that goes a little bit beyond that -- a new interaction, a new force." Punzi said the new observation behaves differently than the Higgs-boson, which would be decaying into heavy quarks, or particles. The new discovery "is decaying in normal quarks," Punzi said. "It has different features," he added. "One thing we know for sure -- it is not the Higgs-boson. That is the only thing we know for sure." Physicists were to discuss their findings further in a meeting to be webcast at 2100 GMT. For more than a year physicists have been studying what appears to be a "bump" in the data from the Illinois-based Fermi lab, which operates the powerful particle accelerator, or atom-smasher, Tevatron. The Tevatron was once the most powerful machine in the world for such purposes until 2008 when the Large Hadron Collider (LHC) became operational at the European Organization for Nuclear Research, which goes by the acronym CERN. The US machine began its work in the mid 1980s, and is scheduled for shutdown later this year when its funding runs dry. "These results are certainly tantalizing," said Nigel Lockyer, director of Canada\'s national laboratory for particle and nuclear physics, TRIUMF. "It is too early to say for sure what the Fermilab team has observed," he added in an email to AFP. "On the one hand, there is clear evidence for something unexplained, and on the other, there is a long list of alternative explanations for what might be causing this subtle observation," he said. "My personal judgment is that this excitement is adding fuel to the fire for the next generation of results and discoveries that will be made at the LHC (in Europe) and elsewhere. We are so close to learning something profound." Lockyer, a former spokesman for the Collider Detector at Fermilab (CDF), which made the announcement, said there is another major experiment going on at Tevatron, a sister project known as D-Zero, which could help confirm the data in the coming months. "They are both multipurpose detectors. They both have the capability of seeing this," he said, predicting a rush of opinions by theoretical physicists in the coming days, and more data that could shed more light on the finding by summer. "It will become very much clearer in the next few months. You won\'t have to wait years."